We suddenly got a few days of perfect weather, and I managed an outing with the Itinerant Mr Bugg, in search of whatever we could find. I admit I wasn’t expecting much; it’s still winter, even if it’s possible to be out in shorts, and only a few days back we were routinely dropping below freezing at night, so spring isn’t here yet. We ended up hitting three different locations in search of subjects, and eventually brought home enough frames to make it seem like we’d actually been out shooting, but I certainly have very little to add to my stock. 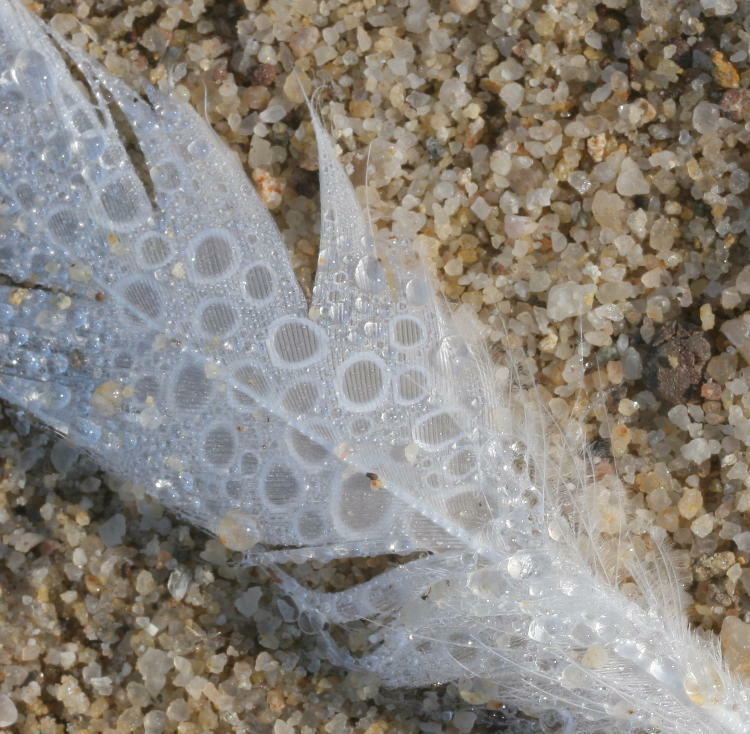 The feather picture above is probably my favorite, capturing the odd effects of dew hanging from the underside. Some of the chorus frogs were already sounding off, but in a location where we couldn’t get very close, and all of the pics I shot from the greater distance lack critical sharpness, so I’m not even bothering with those. 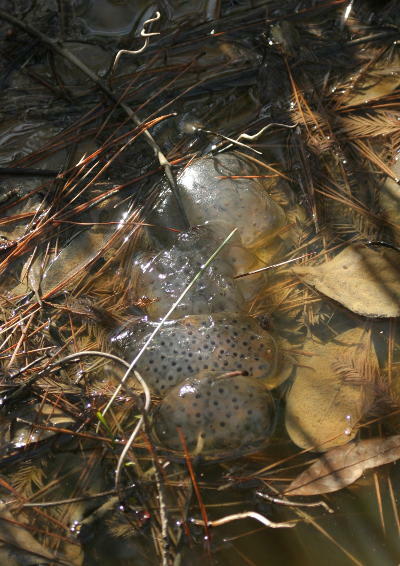 There were also several masses of eggs to be seen at two of the locations we visited, and I’m inclined to say, from the size of the masses, that they were bullfrog eggs, but I’m not even sure they were frogs. The smallest mass was a little smaller than your fist, while the largest would almost have filled a dinner plate. 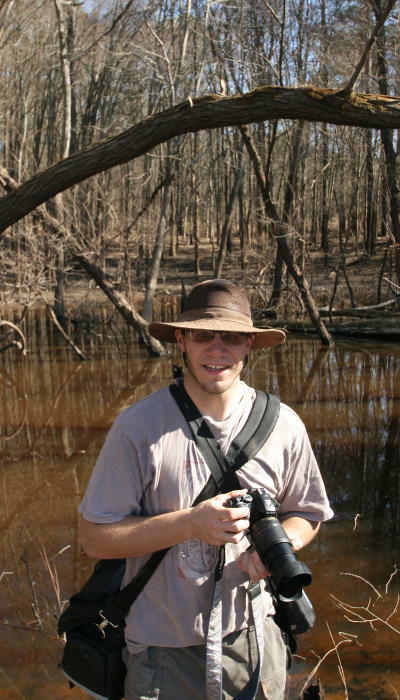 I may try to stop back and see what seems to develop – not even sure that would work, since I had enough trouble differentiating the tadpoles in my own pond. At the first location off of Jordan Lake, I espied some clear evidence of American beaver (Castor canadensis) activity, in the form of clipped off branches 3-4cm thick, showing the distinctive teeth marks. This is not at all uncommon in this region; what got me was where they were, which was 2.5 meters (8 ft) in the air on a sloping limb. 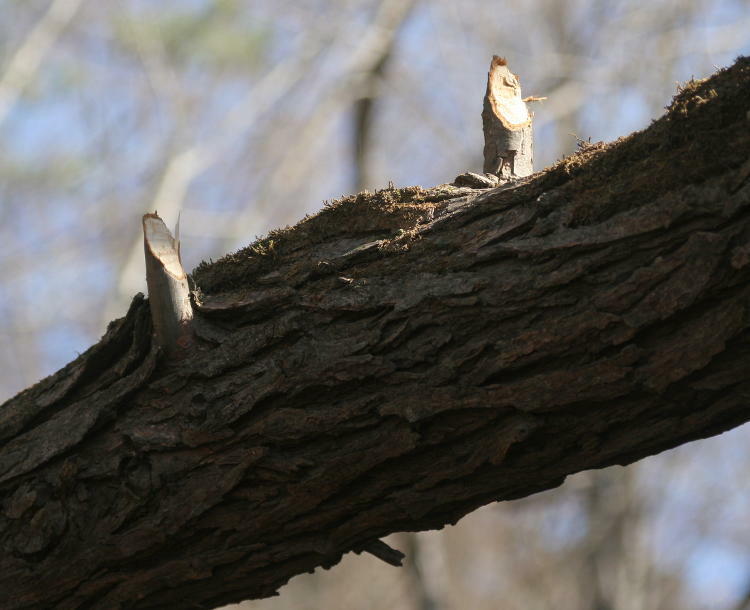 Now, beavers can stand upright and even do some limited climbing, which extends their reach much more than the expected half-meter, but this was well outside of even these accomplishments, especially since the base of the trunk was much more vertical. Instead, I’m almost positive this was evidence of the huge difference in water levels from recent rains; I know I’d seen the lake levels much higher earlier, and this would give an indication they were at least two meters higher than what we were seeing the other day. Mr Bugg was kind enough to pose under the limb, and he stands about 180cm – you can just see the two light spots on top of that crossing trunk, directly above his head. While at the lake, we’d been watching for whatever birds could be seen, but they were remarkably scarce – at best, we saw a handful of gulls and crows. It’s still a little early for the migratory birds to arrive, though perhaps not by much. 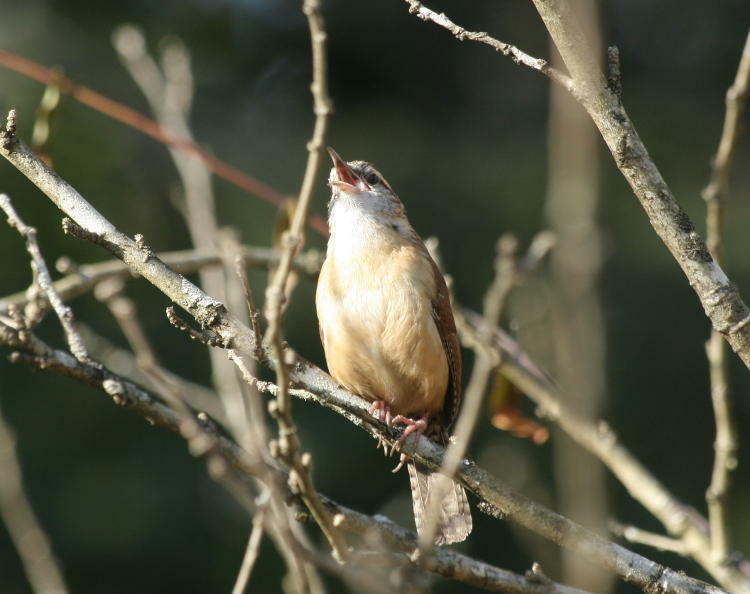 After leaving the lake and going to the NC Botanical Garden, we started seeing some more songbird activity, which continued when we did a brief tour through the nature trails on the back side. 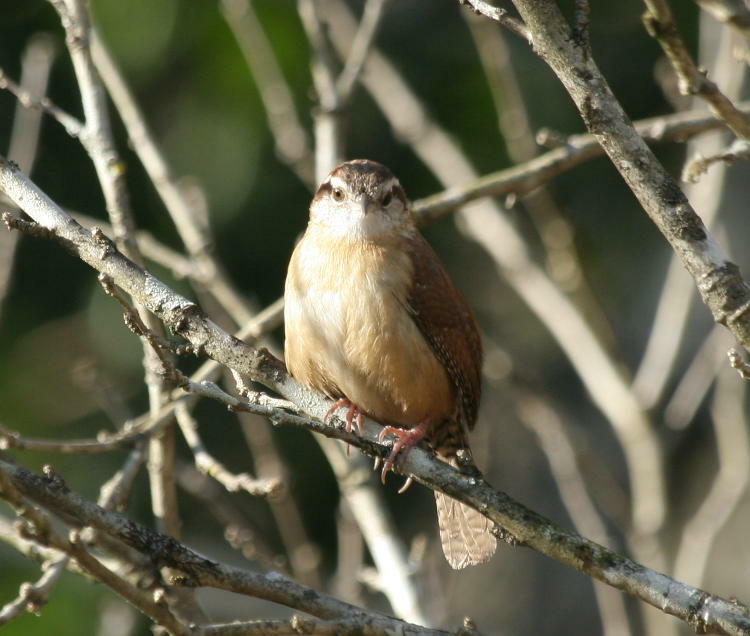 Carolina wrens (Thryothorus ludovicianus) never really leave the area during the winter, but they certainly become a lot more active and vocal in the spring, and one in particular was kind enough to provide some nice poses. As songbirds go, they’re pretty mellow, often allowing a much closer approach than many other species, and will build their nests without concern over their proximity to human activity; under the eaves of a porch is a common location, and I’ve seen them actually raise young in a wreath on a front door. A few years back we put a little box under one corner of our porch roof to encourage their presence, and yesterday I watched one checking it out, so here’s hoping. Meanwhile, let’s take a gander at that cooperative one in the botanical garden. … it ignored me to continue its territorial calls, which are quite distinctive and pleasant. There’s also another call, which sounds irritated and harsh, but from observation I tend to think it’s more of a courtship thing; it seems to be used most often to draw attention to a likely nesting spot. I’ll see if I can get some audio examples sometime soon. And as I shifted position slightly, I got a nice profile shot too. This is the Canon 100-300 L, cropped a bit tighter, but the bird was only a handful of meters away regardless – like I said, humans don’t bother them too much. 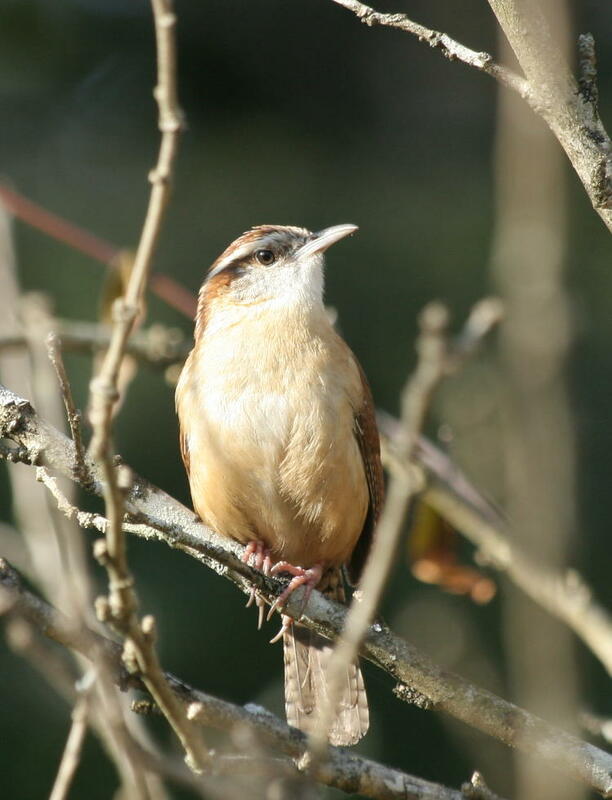 Looking at these now, however, I regret that I didn’t get more typical poses from them, since Carolina wrens have a distinctive body shape and perching behavior that really isn’t shown here. 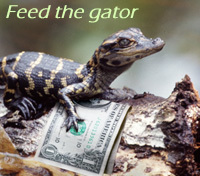 This post has a hint of it, but it still fails to show the cocked-tail position that’s so evocative of the species. 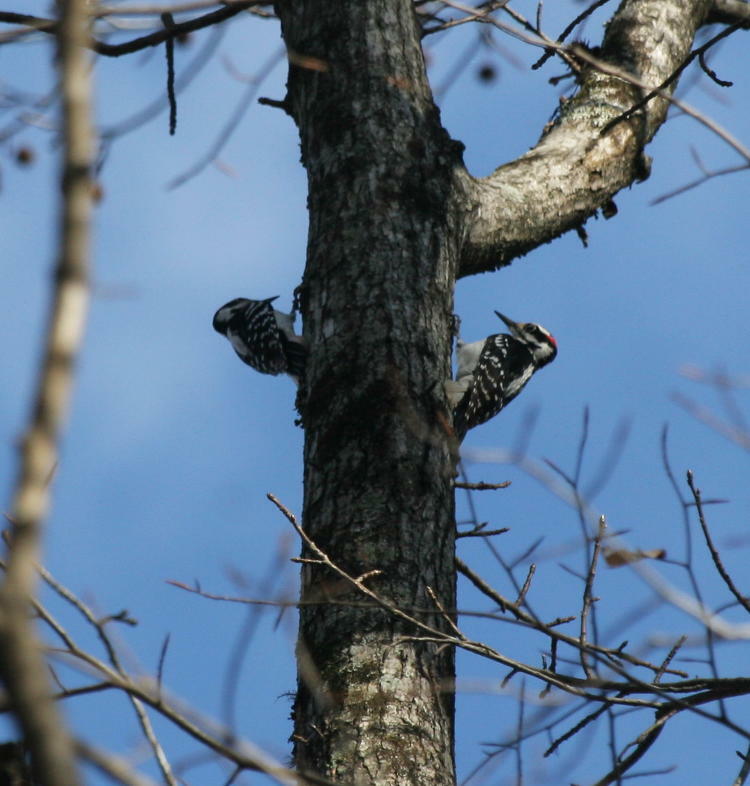 On the nature trails, we saw a trio of downy woodpeckers (Picoides pubescens) in an agitated game of tag way up in the branches over our heads, and managed a few useful frames. I include this view of two of them just for the novelty. There was a little bit of chattering going on, and I suspect this was courtship behavior, with another male intruding temporarily, but they were far enough away that I couldn’t identify gender until looking at the photos afterward. One soon left the area, but the remaining two flitted about in a relatively small space in very close proximity to one another, and I eventually determined that they were male and female. Generally, when it comes to territory, there is more of a squabble, sometimes with direct contact, but usually with one chasing another off for a notable distance, rather than just dodging around trunks within easy sight of one another. This image was sharper (again, pretty good distance directly overhead,) but doesn’t show one detail as clearly as it should, which is the lack of the red patch on the head of the left bird, indicating it’s a female – only the males have that red. So, yeah, pretty sure this was a first date, or at least flirting. Unfortunately, most of the birds we saw were determined to be at the wrong light angle, or in very cluttered framing, so it remained hard to get really captivating photos, though the area we were in showed more than passing activity. 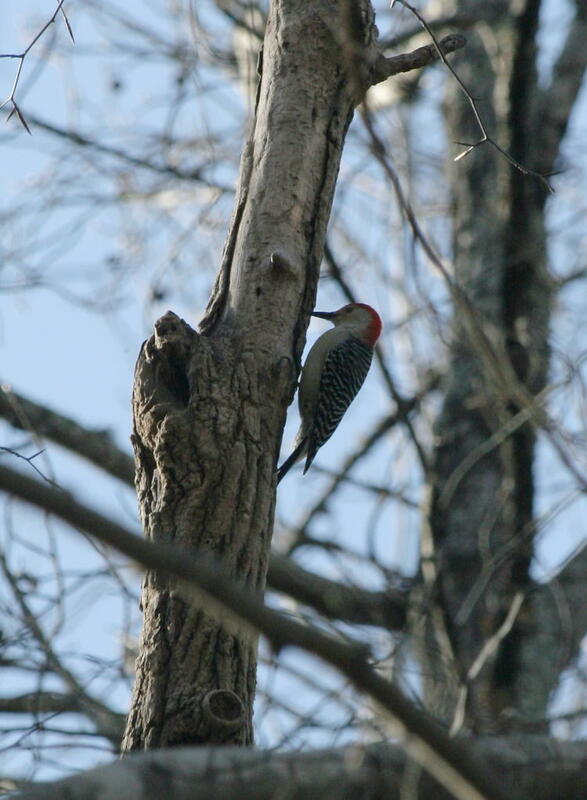 A red-bellied woodpecker (Melanerpes carolinus) gave me only a few moments in profile against the sky, but on the shadowy side of the trunk of course. And talk about a cluttered frame. 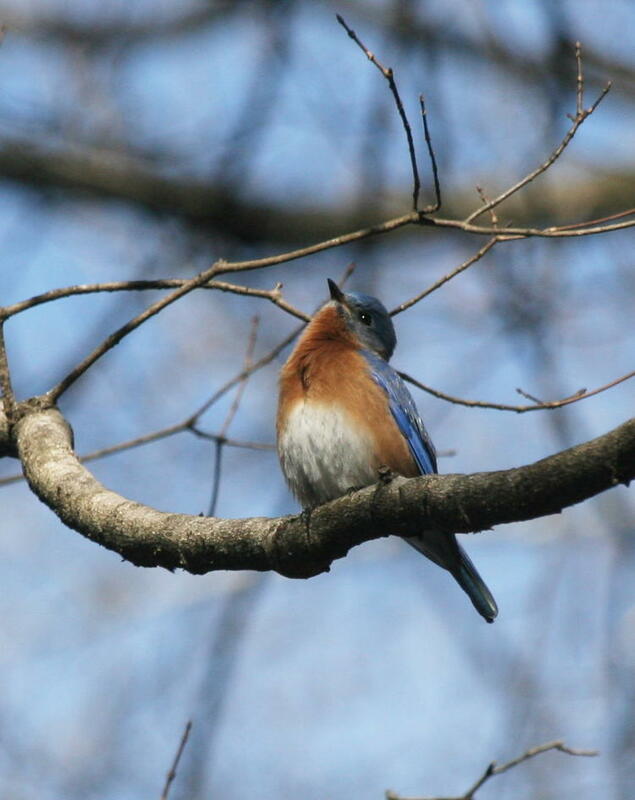 I did slightly better with a male eastern bluebird (Sialia sialis,) who at least got into halfway decent light. 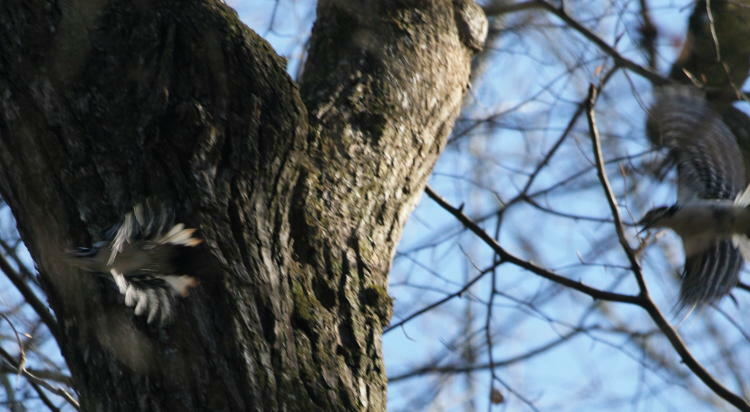 The woodpeckers are often seen here year-round, but the bluebirds are definitely migratory, so they’re apparently making their first appearances here. This one perched and marked territory in the wonderfully understated manner of bluebirds, muttering softly as if humming to itself – it often takes sharp ears to pick out their calls, even when you’re looking directly at them. Yesterday, at the same time that the wren was checking out our porch, a pair of bluebirds was trying to see if the nest box in the front yard was available, but I’m almost positive a flying squirrel had overwintered in it and was probably still in residence, at least if their behavior was any indication. The female had hovered directly outside the box opening for a few seconds without touching down, before the male obtained a perch very close to the opening and sat peering at it for no small amount of time, perhaps trying to embarrass the squirrel into leaving. It didn’t work. It remains possible, by the way, that the squirrel will raise a brood in that box this spring, and I’m more in favor of that than of the bluebirds doing the same – I’ve got photos of nesting bluebirds. We’ll just have to see what transpires, won’t we?